Here’s what I got when I asked the NSA if they’re collecting my metadata. Any positive or negative response on a request-by-request basis would allow our adversaries to accumulate information and draw conclusions about the NSA's technical capabilities, sources, and methods. Our adversaries are likely to evaluate all public responses related to these programs. Were we to provide positive or negative responses to requests such as yours, our adversaries' compilation of the information provided would reasonably be expected to cause exceptionally grave damage to the national security." The letter helpfully states that there are "no assessable fees for the request." It also contains a paragraph about the ways in which the Foreign Intelligence Surveillance Court (FISC) has authorized the NSA to "acquire telephone metadata, such as the telephone numbers dialed and length of calls, but not the content of [sic] call or the names of the communicants." The court was created in 1978, as we recently laid out in our surveillance timeline. The letter also mentions section 215 of the Patriot Act, which the government has cited to justify phone metadata collection. So where does this leave me? According to Aaron Mackey, a staff attorney at the Reporter's Committee for Freedom of the Press, "If you wanted to see those records you would have to file a lawsuit." 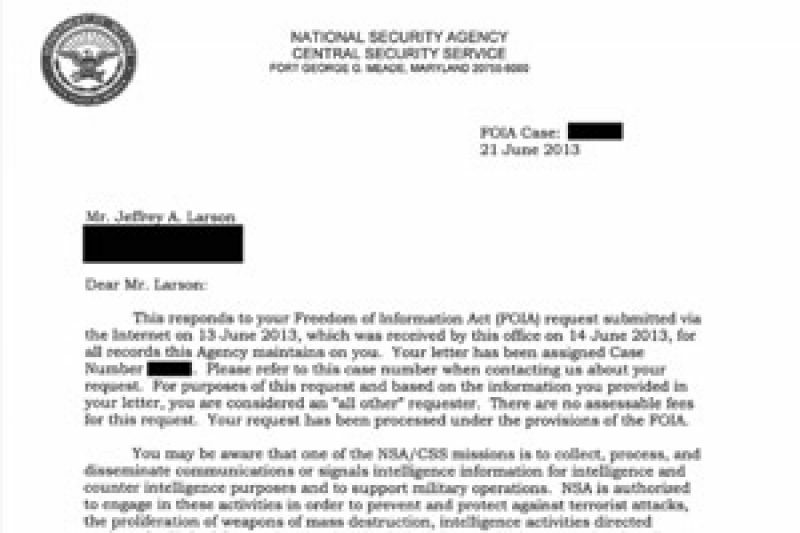 I reached out the NSA, to ask among other things, how many other requests about metadata they’ve received. Update 6/26: Pamela Philips responded to my questions. She told me that "the FOIA Office has received over 1000 requests since June 7th." I asked if the office had approved any Privacy Act requests for metadata, and her response was "no," and added "we do not search operational records on specific individuals."